Pixelmator is a beautifully designed, easy-to-use, fast, and powerful layer-based image editor, built exclusively for Mac OS X, that allows you to create, edit, and enhance your images. Pixelmator takes full advantage of the latest Mac features and technologies like Cocoa, OpenGL, and OpenCL, which giving you speedy, powerful tools that let you touch up and enhance images, draw or paint, apply dazzling effects, or create advanced compositions with ease. Pixelmator comes loaded with tons of breathtaking effects. Choose from more than 160 effects, carefully arranged into eight groups - Blur, Distortion, Sharpen, Tile, Stylize, Halftone, Generator, and Others. Combine different effects for unique, near-effortless artistic creations, and see the stunning results in real time. 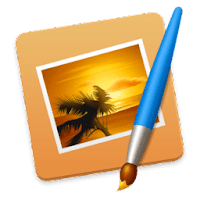 Disclaimer: Direct downloads for the lastest version of Pixelmator 3.6 for Mac are provided by the official software's author, we can't guarantee safety, availability or download speed. Moreover, we don't and we won't provide any pirated/illegal versions or tools. We recommend you to avoid it as these methods can harm your device. If you like the software, buy it to support the developers. (We provide software discounts for many worldwide brands).